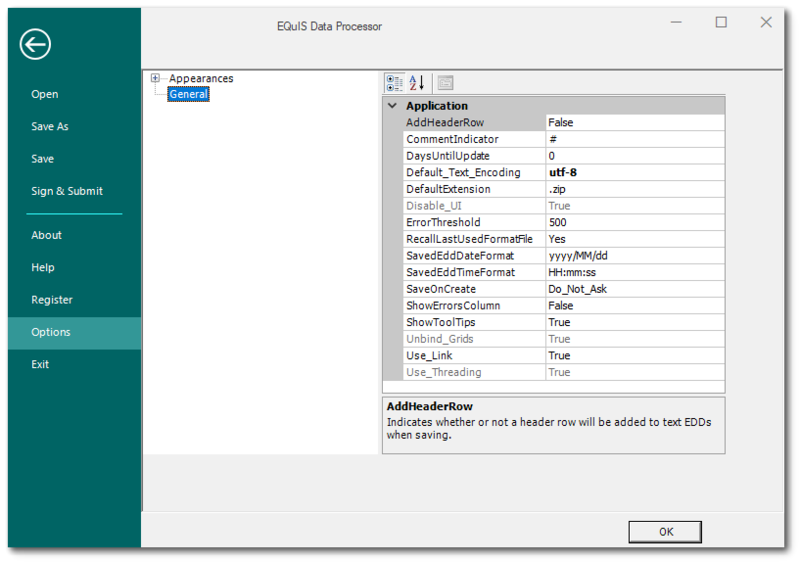 The Appearances section of the EDP Option Menu allows the end user to customize the color palette used for displaying EDD errors in EDP. In addition, the row appearance within the EDD tables can be customized to shade alternating rows. Indicates whether a header row will be added to EDDs when saving. The comment indicated is used by EDP to determine if a Row should be considered a comment row when it is placed at the beginning of a row. This field is used to cache reference values when using EDP Professional. The 0 value means EDP will open all the reference values each time it opens, and will not cache any values. Maximum threshold for error reporting in the error logs. This toggle determines if EDP will open the last used format if True is selected. Determines the save functionality on the create process of EDP Professional. There are three toggles for saving the package, Ask, Do not Ask, or Always Save. The Show Errors column toggle will add a column in the EDD workspace grid indicating the number of EDD errors per row. This toggle will have EDP show tooltips when hovering the mouse.